In Big Sky country, cattle outnumber people. By a lot. Rush hour typically consists of bison or big horn sheep crossing the road. Along Route 94 in Montana, even speed limits are lenient; locals call it the “Montanabahn.” This is Andy Mickelson’s world. The young entrepreneur and hydronic craftsman thrives there. Mickelson brings mechanical wisdom and experience beyond his years to the western side of the state. In 2011, he started Missoula-based Mickelson Plumbing and Heating. During his apprentice years with a large mechanical firm, Mickelson learned his way around big boilers. Today, about 60 percent of his work is commercial – now growing through his experience with Taco’s iWorX modular controls platform. For First American Title in Missoula, the problem with its building was simple: It was hot in the summer and cold in the winter. Word of mouth brought Mickelson to the scene; he won the bid to fix the problem. When he arrived at the 13,000-square-foot building, Mickelson inspected the entire two-pipe fan coil system. He found that the old controls were never right from the beginning. 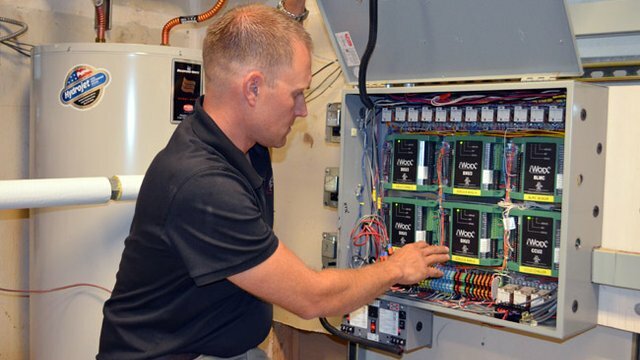 “Taco’s iWorX controls are different from other systems because you don’t need special tools or software to do the installation or commissioning,” Mickelson said. “You just push a button on the controller, and it identifies itself on the network. The system’s installation quickly made a difference. First American has saved between $300 and $400 a month on its electric bill, Serba said. Having more individual control a building’s automation system enhances companies like Mickelson’s.